Flaunt your sense of style and stand out from the crowd while enjoying a satisfying vape experience draw after draw. Choose the color you prefer and order the SMOK Majesty 225W TC Starter Kit With TFV12 Prince today. You shouldn't have to choose between a vape that delivers a satisfying experience and one that suits your sense of style, and with the SMOK Majesty Luxe Edition 225W TC Starter Kit With TFV12 Prince tank, you don't have to. This set includes the finely crafted SMOK Majesty 225W TC Luxe Edition Box Mod and the SMOK TFV12 Prince Tank, giving you two high performance, stylish components for one low price. The kit also includes one 0.4Ω V12 Prince-Q4 Quadruple coil head, and one 0.12Ω V12 Prince-T10 Decuple coil, replacement parts, spare glass and a micro USB cable. 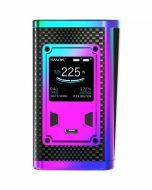 The experts at SMOK have designed the SMOK Majesty 225W TC Box Mod Luxe Edition with careful attention to form. Sleek and modern, the box vape is available in carbon fiber and cobra resin versions in a wide range of standout colors. Both options are durably crafted and comfortably sized to fit in your hand and travel with ease wherever you go. With the SMOK Majesty 225W TC Box Mod Luxe Edition, you're free to vape the way you prefer. 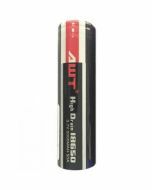 In Watt Mode, you can chase clouds of incredible size with a maximum output power of 225 watts. Switch to Temp Mode to bring out the full flavor of your e-juice with precise temperature controls from 200 to 600 degrees Fahrenheit. The vape is compatible with Ni 2000 nickel, titanium and stainless steel heating elements for even more flexibility. In addition, with Memory Mode, your favorite settings can be loaded with just the quick touch of a button. Operating the SMOK Majesty Luxe Edition 225W TC Box Mod is so simple you can have your vape fired up and ready to go in just a few seconds, no matter how many custom adjustments you wish to make. A full color OLED screen lets you easily see all of the options, and the user interface is highly intuitive, so you can find settings and modes with ease. Two buttons make for quick and easy selections, and the big lateral fire key further simplifies operation. 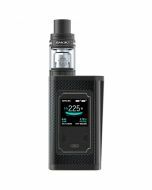 The SMOK Majesty 225W TC Box Luxe Edition Mod is designed for two 18650 batteries (not included). 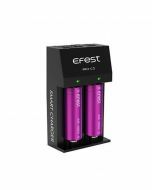 Unlike other vapes that only tell you how much power remains in total, the Majesty vape mod features dual battery life indicators that visually show how much power remains in each cell. 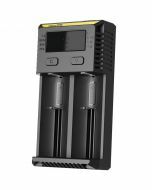 Removing the batteries for charging is easy, thanks to the sliding battery door located at the bottom of the unit. With the SMOK Majesty Luxe Edition 225W TC Box Mod, you can venture into the world of sub-ohm vaping feeling confident in your safety. Intelligent Atomizer Recognition automatically recognizes the type of heating element on board and refines performance to ensure the best possible experience. A puff monitoring system further tailors the experience to the way you draw, and a 12-second cutoff prevents dangerous over-firing. The box mod vape also features protections from short circuit and overheating and lets you know in advance when your batteries will soon need recharging. Accompanying the box mod in the SMOK Majesty Luxe Edition 225W TC Starter Kit is the SMOK TFV12 Prince tank. This top-of-the-line vape tank features a delrin COBRA DRIP TIP that permits a high degree of airflow, so you can take deep, powerful draws. You can adjust the amount of resistance simply by turning the ring at the top of the tank to allow more or less air to flow through the dual air slots. It has wild outlook and special tactility. 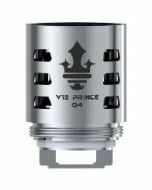 When your e-juice supply needs replenishing, the SMOK TFV12 Prince tank lets you fill your vape with ease on the fly. The e-liquid slot is oversized, so you can easily insert the bottle tip or dropper. A top-fill design further simplifies filling, and the cap has a press and turn closure that prevents leaks.